Reporter and radio station say the charges are baseless. Updated with social media reaction. The mayor offered no evidence about reporter Kenneth Burn’s alleged behavior when she was questioned by WYPR news director Joel McCord at the same Wednesday press conference that Burns was barred from in a emailed notice sent by the mayor’s office to the radio station last night. She earlier described the Wednesday press conference as a “very close-quarters press event” in which she has the discretion to select the reporters present. Her press secretary, Anthony McCarthy then told other members of the press that the matter would not be discussed further. “We’re going to be moving on. Next,” McCarthy said. “I have never received a verbal warning, I have never received a written warning, about my behavior with her or her staff,” he said. Burns has covered the mayor for the last 3½ years for WYPR, a local national Public Radio affiliate, and regularly attends the Wednesday press conference. He said he can only believe that the mayor had been annoyed by his questioning last week about her authority over the police department. Meanwhile, WYPR’s vice president of programming, Andy Bienstock, issued a statement about the reporter’s suspension. “It is unfortunate that the mayor has chosen to limit access to our City Hall reporter and pick and choose who gets to ask her questions,” Bienstock said. “The mayor’s description of PKBNews comes as quite the surprise to those who have worked next to him for years,” tweeted Daily Record reporter Bryan P. Sears. “Is this a banana republic? Come on, man!! #FreeKenny” Maryland Public Television reporter and commentator Charles Robinson wrote on Facebook. “This is petty. Being questioned about policy is part of your job as Mayor. Is this your legacy with less than two months to go in your administration?” the letter read in part. 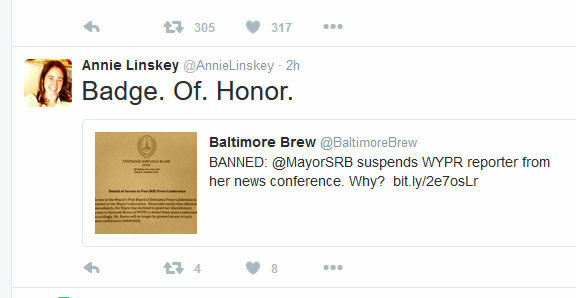 University of Baltimore associate professor of law David Jaros condemned the mayor’s actions as well. 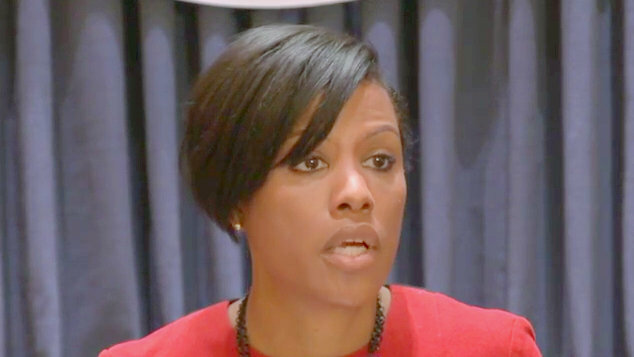 Rawlings-Blake herself entered the fray at one point on-line today, charging that Burns’ fellow local journalists have seen him behaving improperly. “Suggesting that bc the press won’t admit to seeing it that it didn’t happen is awfully ironic 4 truth seekers,” she tweeted in an exchange with WBAL’s Jayne Miller. “This is horrifying,” wrote Julie Bykowicz, a former Baltimore Sun reporter who is now at the Associated Press.